George Gaylord Simpson, 1956 (courtesy American Philosophical Society Library). Joe Cain (ed.) 2018. 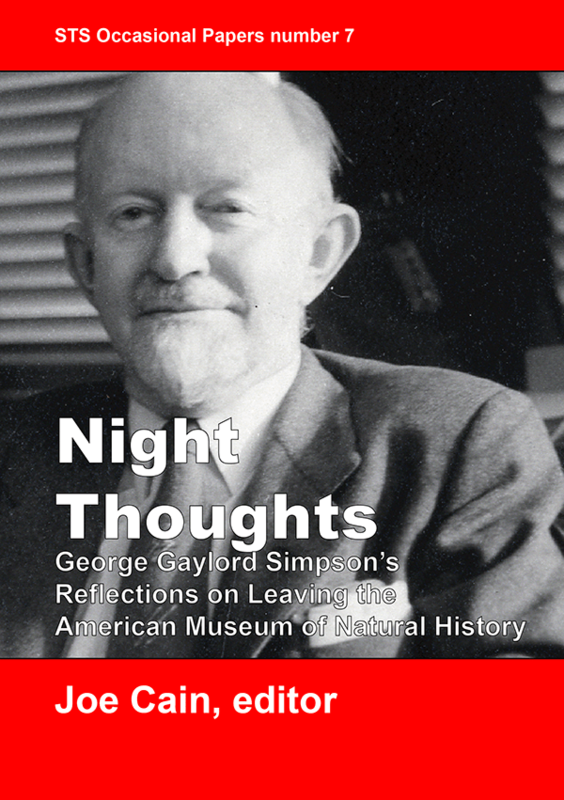 Night Thoughts: George Gaylord Simpson’s Reflections on Leaving the American Museum of Natural History. George Gaylord Simpson (1902-1984) was a leader in twentieth century vertebrate palaeontology, and he contributed to making the American Museum of Natural History a powerhouse in the field. In 1959, Simpson left his job at the museum in a bitter dispute with its management. Simpson never published a rationale for his resignation, but he secretly wrote one. After his first day unemployed, Simpson penned a long account of the circumstances surrounding his decision to leave. This STS Occasional Paper presents a complete transcription of Simpson’s “Night Thoughts,” with brief introductory notes. Simpson was scathing of the museum’s Director, Albert Parr, and his once-close colleague, Edwin Colbert. This STS Occasional Paper also gives Colbert a voice, allowing him a counterbalance via correspondence with the editor about his reaction to Simpson’s essay. The biographer will find key insights into a turning point in Simpson’s career. They also will find a rare glimpse into the American Museum’s management during Parr’s directorship. Loyalties were tested to their breaking point. Some loyalties broke. Cain, Joe, ed. 2018. Night Thoughts: George Gaylord Simpson’s Reflections on Leaving the American Museum of Natural History. STS Occasional Papers number 7. London: UCL Department of Science and Technology Studies. ISBN 978-1-78751-000-5. Open access download (free).